My curls are back. Temporarily. For the past month, my hair has been straight due to flat ironing every two weeks and I enjoy a break from my curls every now and then. 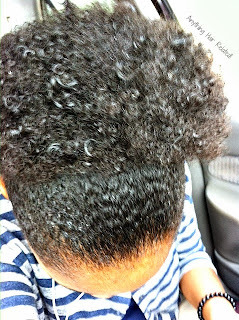 Recently, I oiled my scalp with olive oil to relieve itchy, dry scalp and my hair was so oily that I had no idea what to do with it. This style is so easy and takes all of 5-6 minutes to achieve! I've missed my curls. This puff is my favorite go to style!